When the mercury rises and the sun beats down, the last thing you might associate with a refreshing beverage is a cup of Joe. However, cold brew coffee is rapidly replacing chilled soda as the hipster summer drink of choice. Cold brew is mild and smooth, with less bitterness and lower acidity than hot brew coffee and is the perfect way to bring out the most subtle flavors of the bean. That said, not all beans are destined to create the perfect cold brew, and there are so many different grinds to choose from, it can be tricky for the novice home barista to make the right choice. Luckily for you, dear reader, we at Roasty Coffee have taken time out to prepare this comprehensive guide to choosing the best coffee to put in that cold brew maker. Just for you. Tiny Footprint Coffee is a small US-based coffee roasting house whose ethos is to produce great beans from an eco-friendly, “earth positive” perspective. To offset the carbon that’s used in the production of their coffee, Tiny Footprint Coffee plant trees in the Ecuadorian cloud forest for every pound of coffee that they sell. 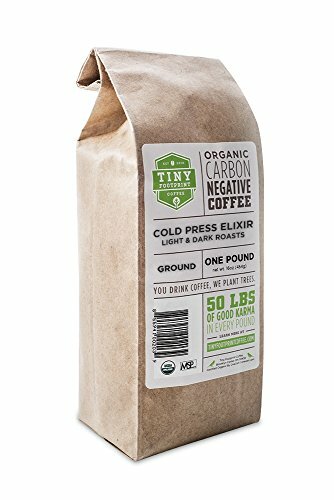 Cold Press Elixir is a blend that’s specifically produced for cold brewing. This Arabica coffee is a mix of dark and light roasts, enhanced with some high-end Ethiopian beans. The result is a sweet, silky, rich flavor with notes of subtle floral and bright fruit tones, infused with cocoa. You can choose from grounds or whole beans if you prefer to grind your own. French coffee shop, Café Du Monde has been operating in New Orleans since 1862. Their trademark chicory coffee makes an outstanding cold brew. 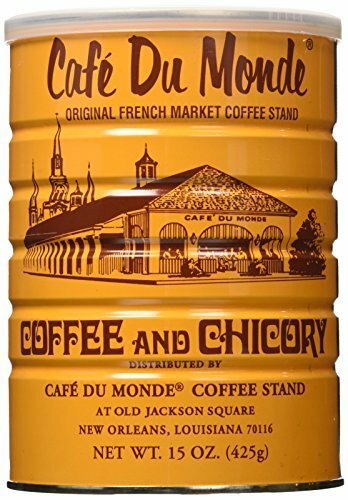 To make this tasty blended coffee, chicory root is cooked, ground, and then added to the grounds to reduce the bitterness of a dark roast. The result is a sweet, smoky aroma, light body, and mellow flavors. This coffee is smooth and very low in bitterness, tasting great when brewed hot or cold. The end brew works well with milk or cream too. Cold Buzz Coffee source their 100% Arabica beans from South and Central America and Europe. 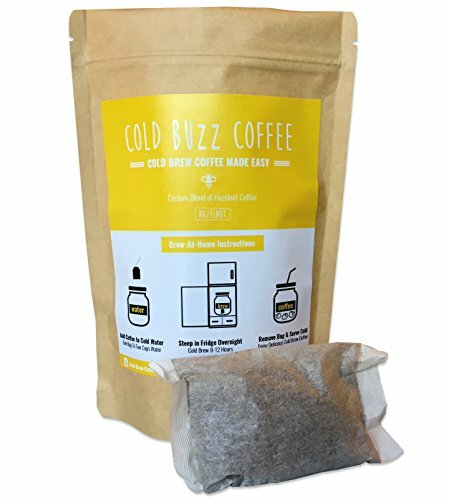 Cold Buzz Coffee makes cold brewing straightforward by selling their coffee pre-ground in bags similar to tea bags. All you have to do is soak the coffee-bags overnight in water. The company produces a number of different flavors, but we especially like the hazelnut. The dark roast beans are enhanced by the sweet buttery flavor that’s delicious in a cold brew. The main drawback of this cold brew coffee is that you have no control over the number of grinds used. Consequently, you may find the result too strong or too weak for your taste. 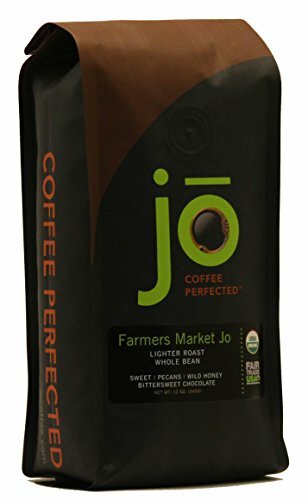 Farmer’s Market Jo uses a blend of only directly sourced raw Arabica coffee from artisan roasteries around the world. This light-medium roast is the best way for novice cold brewers to experiment with the technique. The flavor is nutty and sweet, ideal for cold brewing and works great with a splash of cream for a refreshing summer beverage. 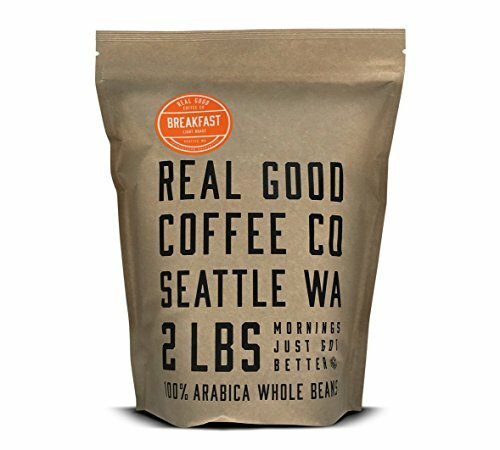 For those who prefer to grind their beans themselves, The Real Good Coffee Company Breakfast Blend is the way to go for cold brewing. The Arabica beans used in this light roast morning coffee are sourced from South and Central America, before being roasted fresh in Seattle, USA. The citrus flavor of this blend is balanced nicely by creamy, chocolate flavors, so the fruity, bright tones of the coffee shine through without acidity. For best results, you’ll want to steep your grounds for at least 20 hours before use. What is cold brew coffee anyway? To know which beans to choose for a perfect cold brew, you need to understand the brew itself. Unlike iced coffee, cold brew is made without using any heat whatsoever. To make cold brew, ground beans are steeped in cold water for a long time to bring out the flavor of the bean. Iced coffee is made from cooled, regular coffee that’s poured over a glass of ice. What gives cold brew its distinctive flavor? It’s the absence of heat in the brewing process that gives cold brew its unique flavor and character. However, cold brew is more expensive to make than traditional hot brew coffee because it requires twice the amount of grounds. The flavors in cold brew tend to be muted because the acids and other solubles in coffee are only derived when the beans are exposed to higher temperatures. That makes cold brew coffee easier on the stomach, although the flavor can be too bland for some palates. The method that you use to make your cold brew will affect the type of bean you choose. The immersion method of brewing involves steeping the ground beans in cold water for up to 24 hours, before filtering them. The slow drip process involves slowly dripping iced water onto the grounds and collecting the resulting brew in a carafe below. This method is the quicker of the two, although it still takes up to five hours to make one cup of cold brew. When it comes to flavor, the immersion method of brewing yields a more full-bodied, concentrated drink than the more dilute, medium-bodied brew produced by the slow drip process. The flavors that you derive from your blend are based on the Specialty Coffee Association of America’s Coffee Taster’s Wheel. The guide is used by producers to label the flavors of their blends and will help you to work out what to look for in a cold brew bean or grind. On the right side of the wheel, you’ll find medicinal and acidic flavors. Thanks to the cold brewing process, these flavors can be lost, although some of the more floral and fruity notes will come out. On the other extreme, if you pick a roast that gives lots of cocoa, spice, and sweet notes, you could find that the result is overpowering. So, to play it safe you should stick to the middle area of the wheel for cold brewing. Alternatively, employ a longer steeping time for a light roast. It’s a matter of experimenting until you find the combo of bean and brewing time that works best for you and gives you the flavor result you want. Blends or single origin coffee? If you’re new to cold brewing, your safest bet is probably single origin bean coffee. These tend to have a clearer flavor profile than blends, so you’ll enjoy the full range of each flavor. So, whether you’re buying pre-ground beans for cold brewing or grinding them yourself, you should know that grind does matter. If the grind is too fine, the flavors of the finished brew will be bitter and harsher, because of over-extraction. Therefore, your grind should be coarse for cold brewing. Also, if you’re using the slow drip method of cold brewing, a coarse grind will allow for a quicker flow, whereas a fine grind is too dense, restricting the flow of the water. Coffee aficionados insist that cold brew coffee has a natural creamy mouth and doesn’t need enhancement with milk or cream. Our advice is to try your finished brew first. If you prefer a little dairy in your coffee, add some. But you may find you don’t need it. A blend of three parts cold brew to one part milk works well; it’s all just a matter of personal taste. When adding ice to your cold brew coffee, remember that ice will melt on a hot day! Melting ice will dilute your brew, potentially spoiling the flavor that you’ve worked so hard to achieve. Balled ice melts more slowly than cubes (yep, really), and thus causes less dilution. Perhaps the best option is to use whiskey stones. Whiskey stones or rocks can be placed in your freezer until ice-cold and then used to chill your drink without diluting it. Perfect. An alternative would be to freeze your cold brewed coffee in an ice tray and use the cubes to chill your brew. Genius. If you want to give your cold brew coffee a twist, you could try adding a shot of booze. Avoid anything with coffee flavor though, as this will destroy the brew’s characteristic taste. Take a slice of fresh lime and rub it around the rim of your glass. This cold brew spritzer makes for a very refreshing hot weather drink. Cold brew coffee is a very refreshing summer beverage, but you do need to make it properly. Happy caffeinating, and stay cool. While you've undoubtedly seen the name either at your gym or in your favorite coffee café, not everyone knows what this trend is about. So what is nitro coffee? And what's with the hype? 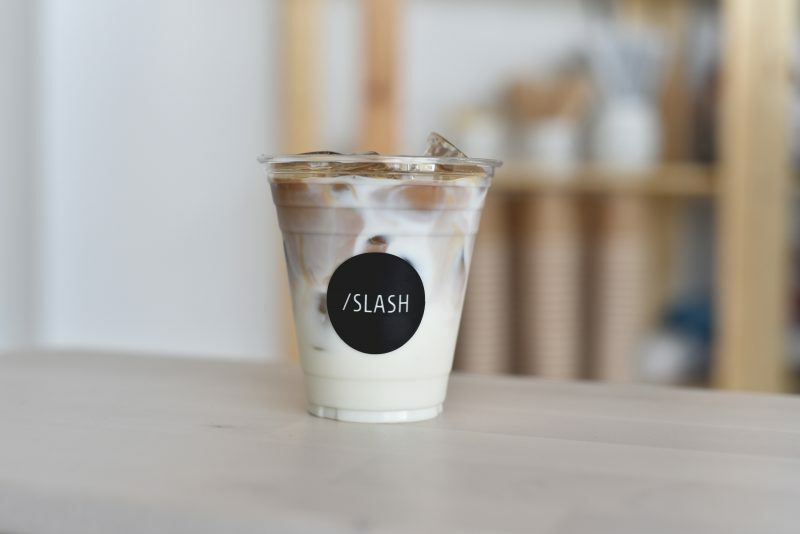 Read on for the full low-down on this coffee trend. Craving a the sweet brown sugar notes of a good Oliang? Try getting your thai coffee fix on ice with our absolute favorite thai iced coffee recipe list.